#Briar is an unusual kind of messenger for Android devices: there are no servers, messages are stored on your phone and sent directly to your contact&apos;s phone through TOR, wi-fi or bluetooth. It&apos;s designed for journalists, activists, people working in disaster zones and anyone interested in "off the grid" communication. @switching.social Are they on Mastodon? @switchingsocial @fdroidorg my friend just said tor was compromised by feds a long time ago? For was developed by the navy. It has been broken a number of times but that's why there's updates. Your friend is confused. #Tor was (is?) developed and funded by the US navy. There are a number of ways of "compromising" Tor, depending on your definition of compromise. There is no such thing as absolute comms security, other than no comms. There is knowing what different tools can and cannot do and choosing appropriately according to one's needs. @switchingsocial @fdroidorg A desktop app is not available? As far as I know it&apos;s only on Android? However, you might want to check out the social network Scuttlebutt which works on similar principles. Have you actually tried #Briar? The majority of scenarios where it comes in handy strike me as not being entirely compatible with desktop use in terms of a) mobility and b) deniability. Convenience and security are often exclusive choices. Briar leans towards the latter. Also https://delta.chat is similar, I think. @UnclearFuture @switchingsocial @fdroidorg delta chat uses plain emails and pgp. You still leave meta-data and need mail servers. I understand the reasons why but it is kinda annoying that there are no iOS versions for any of these apps/services/protocols, at least not yet. 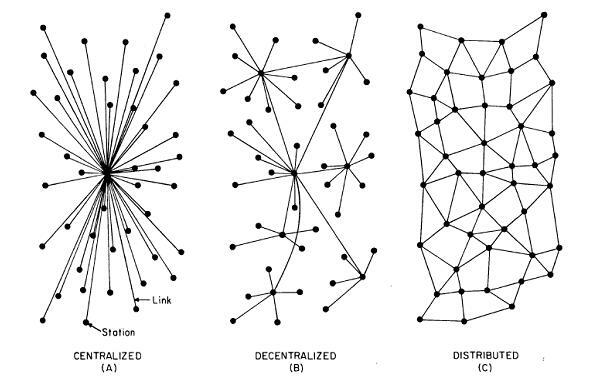 Exactly like this, decentralised and doesn’t have metadata, is encrypted with good encryption etc? As for encryption there are some iOs clients for XMPP that support the OMEMO encryption scheme, like Signal. However that's a federated service and relies on XMPP servers (which you can run on your own though). As for metadata, it's possible to run those over tor but that's not so easy. I am afraid atm you cannot have all of your needs readily available. @UnclearFuture @ckeen @fdroidorg @switchingsocial reminds me a bit of firechat for iOS. Doesn’t look like it is open source, but I will check it out. GPL 3, encryption by default, distrbuted (as in https://ipfs.io/ipfs/QmNhFJjGcMPqpuYfxL62VVB9528NXqDNMFXiqN5bgFYiZ1/images/centralized-decentralized-distributed.jpg). Text messaging, audio calls, video calls (although a bit laggy), and group conversations (although sadly they're not persistent yet). Thank you, unfortunately there is no Tox client being actively developed for iOS. There is a client, but its not had an update for more than a year now. Sorry I don't have an iOS device myself so I wouldn't know. Have you tried the client anyway? Oh, yes, I do use it, just worried that it isn't keeping up with both the latest features and security patches because it isn't getting updated. @switchingsocial @fdroidorg Another characteristic of #briarproject is that you must initiate your contact in person: each person generates a QR code and scans the other's key. #TOFU with real people. The current downside of Briar is that it's quite battery draining. But it's one of the very best P2P secure messaging systems. A messaging service which uses internet/NFC, but only on Android platform? That seems not very useful imho. Many hurdles to use. @switchingsocial @fdroidorg Man. Wish it was on IOS. I would love to have this on my phone.